That’s “Hello” in Portuguese! My ten-day trip to Brazil with three other Keynote staff was wonderful! The four of us taught classes and coached students in public speaking at the request of Janiê Sucupira, the director of Campus Crusade for Christ’s new Brazilian music ministry (Brasil Música e Missão, or Brazil Music & Mission). As in many Latin cultures, the people of Brazil are warm and relational, and we were welcomed with open arms. Friendships quickly grew with the students, even (through translation) with those who didn’t speak English. 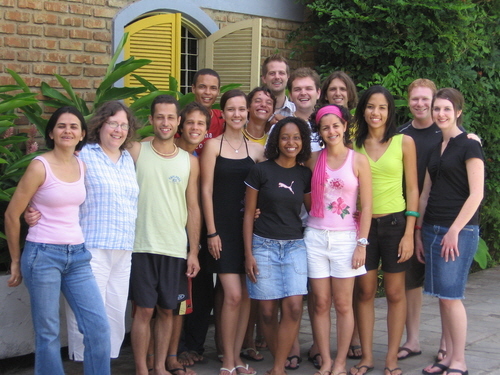 There were ten students on the music summer project, which ran simultaneously with a Brazilian Campus Ministry project, with about another 30 students and staff. The Campus Ministry folks were invited to sit in on six of our public speaking classes, and most took advantage of that opportunity. Despite cultural differences, it was quickly apparent the principles of our classes are transferable! It was wonderful to hear the students (and the members of the church we attended Sunday night) sing familiar praise songs in Portuguese. It reminded me that, as Paul said in I Corinthians 12:20, “there are many members, but one body.” There is one church with many members around the world, and we are all brothers and sisters. After we returned home, the student band performed three concerts at the state university nearby. They had to perform all three times with only one speaker functioning in their new sound system (personally, I think the devil enjoys messing up technology!). But God worked in spite of the technical difficulties: 165 people indicated on comment cards that they accepted Jesus as their Savior! I’ve loved helping my dear friend Janiê turn her ministry dream into a reality! And I’m awed and humbled at how God can use ordinary people who are yielded and available to Him to make a far-reaching impact for His kingdom. People like Janiê, or my teammates, or me…or you! Thank you for extending God’s kingdom in Brazil through your gifts and prayers! For Janiê as she prepares to give further training to these new staff members when they arrive. For Janiê’s knee surgery on March 3 to repair a torn ligament.